November 2, 2016, 9:09 AM · We have teachers for everything under the sun. If you love new ways of looking at things, three different violin teachers will teach very different ways to hold your bow, get into the string and make a gorgeous sound. Don’t feel like studying music? You can get an MBA or a law degree, subjecting yourself to the detailed syllabi of teachers for two to four years, but feel like what you needed to learn was not spoken of, or worse, considered unteachable. That knowledge “which cannot be taught” is the Holy Grail that must nevertheless be learned, if you want to feel fulfilled, personally and artistically. Art functions best when it’s personal and intrinsically felt. In music, it means the difference between following the instructions of others, and finding your own way while listening to your inner voice. Once the teacher speaks the truth as he sees it, he has the power to imprint a definite image into the student’s mind. However, that truth may shut off the student’s mind from a more natural realization. For instance, if he’s teaching the student a bow hold with fingers evenly spaced, it may prevent him from finding one that’s more natural for him, even if the spacing is uneven. However, if the teacher sees the big picture, and says there are other ways of doing it, the door is still open. A child’s mind needs permission to think outside the box. Adults, because of the vast encyclopedia of experience floating in the their head, have amazing minds unavailable to children. The roadblock here, however, is that adults feel most comfortable when their world is predictable and they have faith in what they know, even if it’s not working for them. The openness that our minds are capable of is the gift each one of us must cherish, for in music, everything changes so fast that every possibility exists. Will we grab the one that feels most familiar, even if it doesn’t feel very musical? Will a different option unleash a world we did not know existed? Composers provide something that performers are less capable of, which is the perspective of knowing the source of what musicians strive for. To create perfection, such as a late Beethoven String Quartet or Verdi’s Falstaff, composers are privy to the struggle of getting their minds up to the task they have set themselves. There would be no late period if Beethoven hadn’t come to terms with his deafness, as expressed in the Heiligenstadt Testament. It’s the same with performing; the violinist knows what he wants the music to sound like, depending on how good his ear is. The struggle ensues as the widely divergent abilities of technique and musical desires dance around each other. Schoenberg writes as a musical philosopher, trying to understand when the light shines through, and how and why more expressive musical statements are created. How do you separate that which is a copy from that which is the genuine article? Here’s a little thought experiment from the mind of Schoenberg. He explains why the road to a goal should be achieved by concentrating on what the final product should sound like, rather than attempting to lay the road out to help get to the goal. Imagine you are a teacher trying to instill the concept of a straight bow on a student, or explaining how he get into the string without scratching. Schoenberg grapples with the conundrum that, while there may be a definite goal to achieve, how do you go about it without lots of unwanted side effects? He brilliantly describes the three roads that can be taken, all of which do not necessarily achieve the breakthrough that the student is looking for. The language is philosophical, but not obtuse. As you read his words, think about the difficulties of imparting on a student a skill such as playing with a straight bow. Which is the noblest and most pure way to get to an artistic destination? Schoenberg suggests that telling a student how to do something is not as effective as illuminating the desired result. How many ways are there to teach a child to draw a straight bow? Methods, some tried and true, and some not, end up cutting and slicing the string, or stifling the natural flow of the arm. While telling a student to move the wrist out on a down-bow and in on an up-bow may work with some violinists, it may cause problems with bow changes later on. If you apply the logic of Schoenberg’s teaching style to the straight bow problem, you would advise the student to concentrate on the path of the bow while thinking only of the bow. If he thinks about how his hand moves, he takes his mind off the more obvious goal. It’s not easy, because the playing point, the spontaneously changing part of the hair that’s contacting the string at any given moment, is moving seemingly faster than the brain can keep up with it. But the mind quickly adapts and figures out that it can move faster than the bow. At the same time, the mind takes care of other techniques as well: how the hand, arm, fingers, etc. move. If the bow moves as a direct result of the mind concentrating on the bow itself, the arm and everything else will just go for the ride. The arm will take care of itself if the mind is literally aware of where the bow is at every moment. 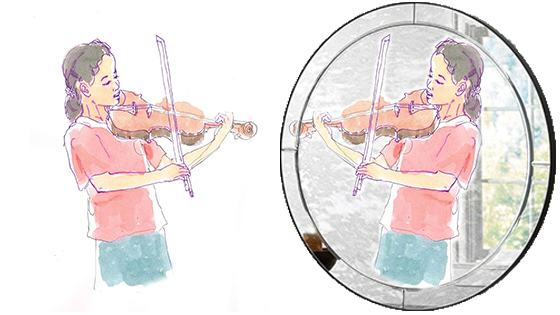 The teacher can act as the mirror and let the student know when the bow is starting to fan, and fan it will! When the bow isn’t directed to move straight, it inevitably follows nature’s whim and drifts with overwhelming hydrolic power, especially when changing strings are involved. When the mind directs the most important element, the bow itself, obstacles vanish. It may not be easy at first. Resisting hydrolic pressure is no picnic, but doing the right thing has a winning way about it. Schoenberg began his essay with “I believe art is born of ‘I must,’ not ‘I can’…Perhaps he [the artist] was not born with something; then he acquires it-manual dexterity, command of form, virtuosity.” It is this act of having to absorb something that doesn’t come naturally, that enables us to dig deep for truly creative strategies and answers. No teacher can give these breakthrough moments. The best can inspire us to look for them ourselves. November 2, 2016 at 07:08 PM · "Will a different option unleash a world we did not know existed?" What an incredible idea to contemplate as I practice and perform! You have yet again written a piece that is both extremely informative and genuinely thought provoking. I will look for the Schoenberg article as well. Thank you! November 4, 2016 at 03:50 AM · RIGHT ON!